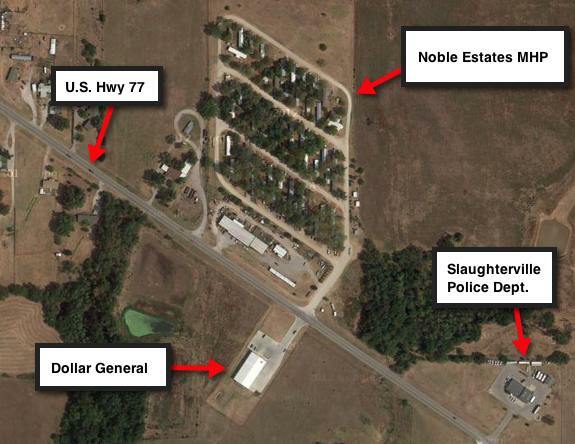 Noble Estates is located in Slaughterville, Oklahoma on Highway 77 right next to the Slaughterville police station, and across from Dollar General. We are open every Tuesday through Saturday from 7 a.m. until 6 p.m. We are closed Sundays and Mondays. There is no appointment necessary. Please feel free to stop by anytime before 6 p.m. and let yourself into our homes to look around. You’ll find applications and instructions on the kitchen counter. From Norman, Oklahoma, take Classen Boulevard south under Highway 9. There, Classen becomes Highway 77. Continue 8 miles south to Slaughterville. We are located on your left, across from Dollar General, and just before you reach the Slaughterville police station. From Purcell, Oklahoma, drive 7 miles north on Highway 77. We are located on the right just past the Slaughterville police station, and across from Dollar General.